Hiking, biking, fishing, swimming, canoeing, kayaking – explore. The north shore of Lake Superior provides the thrill. Campground with cabins and camping – RVs and tents. AND COMMUNE WITH LAKE SUPERIOR. LAMB'S RESORT IS ON THE BIG LAKE. and the Cross River Heritage Center next door offers a fascinating window on years gone by (free admission). Superior Hiking Trail : Take the spur trail up the Cross River to access the main trail, then head northeast to the Temperance River or southwest to the Cramer Road. Access is also easy from the Sawbill Trail, the Onion River Road, and the Ski Hill Road. Sugar Loaf Cove: Cared for by an organization that focuses on land stewardship, the site offers interpretive trails, a beautiful cobblestone beach, and 1.1 billion year old lava flows. 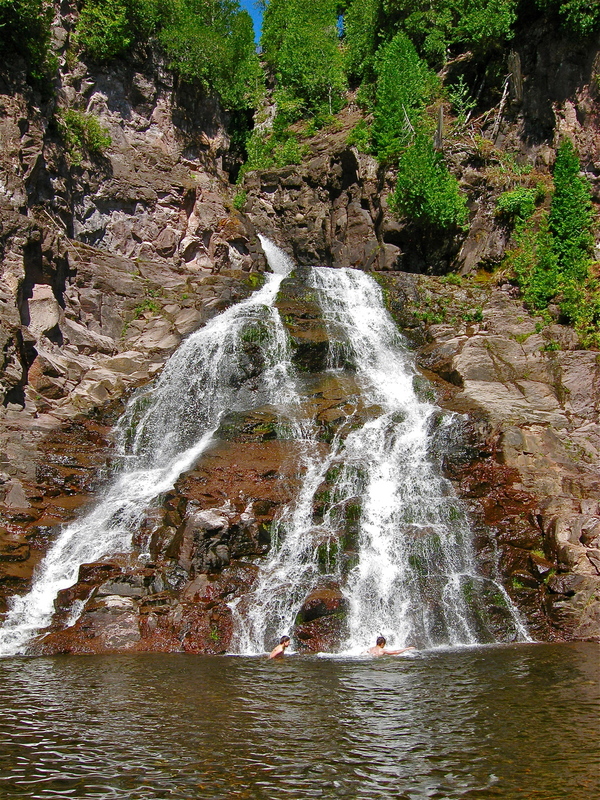 It is located on Lake Superior, eight miles southwest of Lamb's. Temperance River State Park: We are one mile from the Temperance River, one of the most popular hiking areas on the North Shore. Cascade River State Park: There is a good restaurant here in addition to hiking trails, 20 miles from Schroeder. Tettegouche State Park: The beautiful Baptism River and Shovel point offer gorgeous lake views and the highest waterfall in Minnesota, only 20 miles southwest. Judge C. R. Magney State Park: This park is 45 miles away, northeast of Grand Marais, but its Devil's Kettle is worth the drive. Gooseberry Falls State Park: Stop here on your way if you're driving from Duluth, we're another 40 miles northeast. Gitchi Gami State Trail: This paved bike trail now runs from Schroeder (Lamb's Resort) to Lutsen Mountains through the Temperance River State Park, a section about 12 miles long. Britton Peak Mountain Bike Trails: Only 7 miles away up the Sawbill Trail, these single tracks offer challenges for beginners and advanced riders. 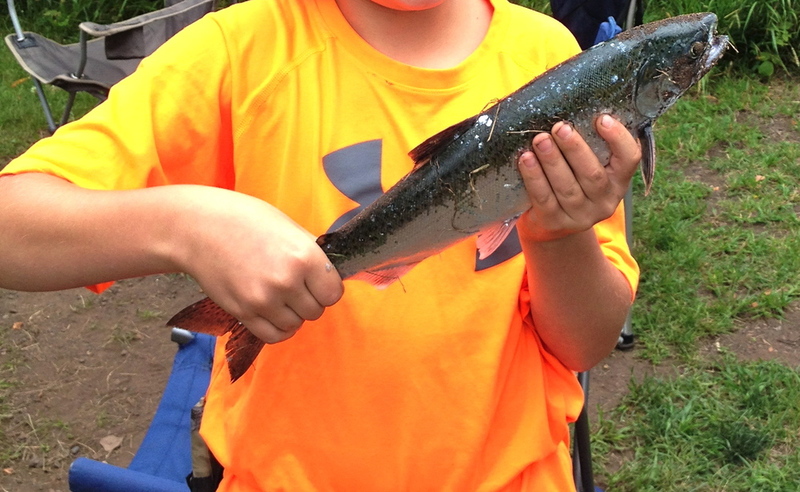 Our shoreline: Throw a line in the lake or the river for a chance at salmon, trout, walleyes, and northern pike. Inland lakes and streams: We have a map showing local lakes and streams within 20 miles of our campground and can tell you where you can fish from shore and where you'll need a boat or canoe. BWCA: Day permits are free and self-issue at the entry point. Local swimming holes: Some are safe for smaller children. Ask us. Lake Superior: Brrrrrrr, but folks jump in (usually older kids on a dare). Swimming pool: Grand Marais has an indoor pool, 30 miles away. Lake Superior beaches: Any of them can yield treasures. Canoe and Kayak rental: Rent canoes and kayaks (and bicycles) 4 miles up the road in Tofte at Sawtooth Outfitters, or rent a canoe on the edge of the BWCA at Sawbill Outfitters on Sawbill Lake. Lake Superior: Some folks put in right off our beaches, but there is a small public landing only 1/2 mile away at Father Baraga's. Inland lakes and streams: You'll never run out of options. BWCA: Day trips are free and permits are self-issue at the entry point. 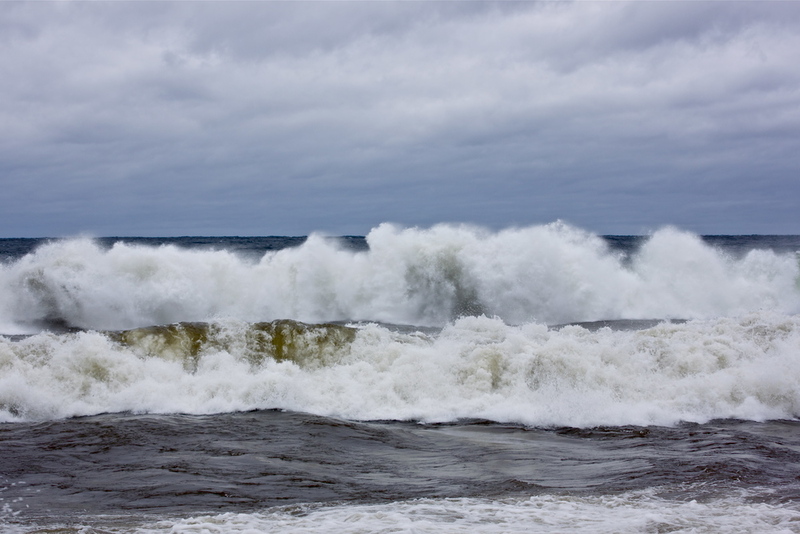 The biggest waves on our shore are created by strong, sustained winds from the east. Pay attention if you want to catch them. Beautiful beaches and cliffs: Enjoy Lake Superior's shoreline at Lamb's Resort, Temperance River, Sugar Loaf Cove, Baptism River, Cut Face Creek, Palisade Head, Shovel Point, and many other access areas. We have a gift shop with sweatshirts, mugs, and more! The Cross River Heritage Center next door also has a gift shop. Groceries, gasoline, gifts, and an outfitting store can be found 4 miles northeast in the major metropolis of Tofte. Temperance Traders liquor store and gift shop is within one mile of us. And Grand Marais, with its many shops and restaurants, is a beautiful 30 mile drive away. Walk to the Schroeder Baking Company (a great little coffee shop right here in Schroeder). Also within 20 miles are: Finland (Our Place, Westbranch, 4 Seasons), The Trestle Inn, Bluefin Grille, Coho Cafe, Lutsen Mountains (Lutsen Resort, Papa Charlie's, Mogul's Grille), Lockport, and Cascade Lodge.